The rocky coast of the Azores. Photo by Luis Cardoso / Unsplash. Portugal is trending this year, which means its now-autonomous Atlantic islands aren't far behind. Scientist Julie Pullen turned a work trip into a short vacation and discovered all the wonders the Azores have to offer. THE AZORES – The Azores have been on the radar of rugged European types for some time, but are only now developing a following among travelers from the northeast United States and Canada who are looking for an easy island destination in the age of Zika and fear. The 2015 expansion of non-stop inexpensive flights to the Azores from North America makes this a dream adventure destination. I'm an earth scientist, so I went to examine a field site for weather measurements on the islands, but I brought my husband along and we enjoyed a fall weekend getaway on the main island of Sao Miguel. The "Hawaii of the Atlantic" shares a volcanic origin with Iceland along the deep-sea mid-Atlantic spreading ridge. But the Azores, situated farther south, are fortuitously bathed by the warm waters of the Gulf Stream. The balmy climate, new boutique hotels, and extensive outdoor adventure opportunities make now a prime time to encounter what Mother Earth tossed up in the middle of the North Atlantic. Like Madeira, the Azores are an autonomous region of Portugal — though more primal and remote than the larger island 600 miles to the east. Here in the Azores, a Portuguese design ethos infuses seaside bathing shelters and new hotels with EU-caliber infrastructure. The appealing juxtaposition of civilized wildness makes for a winning draw for visitors. Cows (almost) outnumber people here. All photos by Julie Pullen. The island of Sao Miguel is a landscape of verdant, pastoral gorgeousness. Volcanic rock fences and rows of blooming hydrangeas separate numerous farms. We spotted longtime locals on the main roads driving horse-drawn carts. The island's strategic mid-ocean location has made it a significant maritime post throughout history. A vibe of self-sufficiency suffuses the wind-swept outpost. 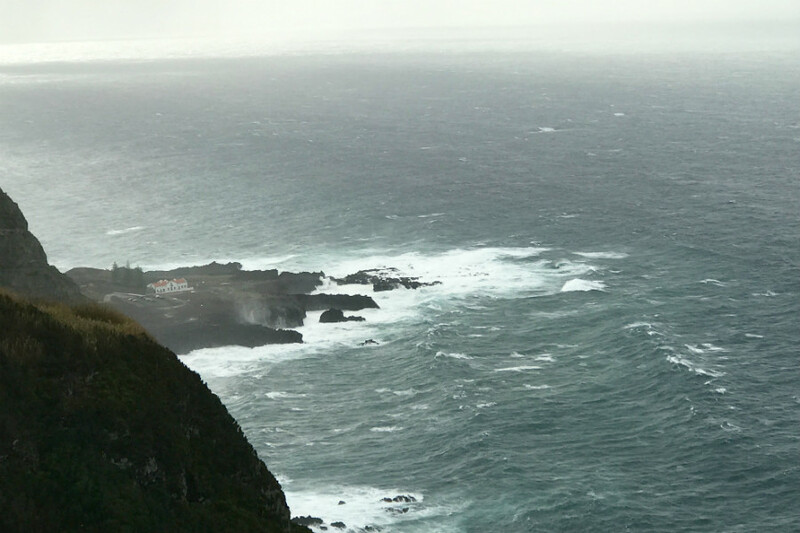 The fierce weather that can engulf the island in winter contrasts with the highly benign flora and fauna. There are no hazardous critters and spiders to fascinate the locals, as many are not endemic. 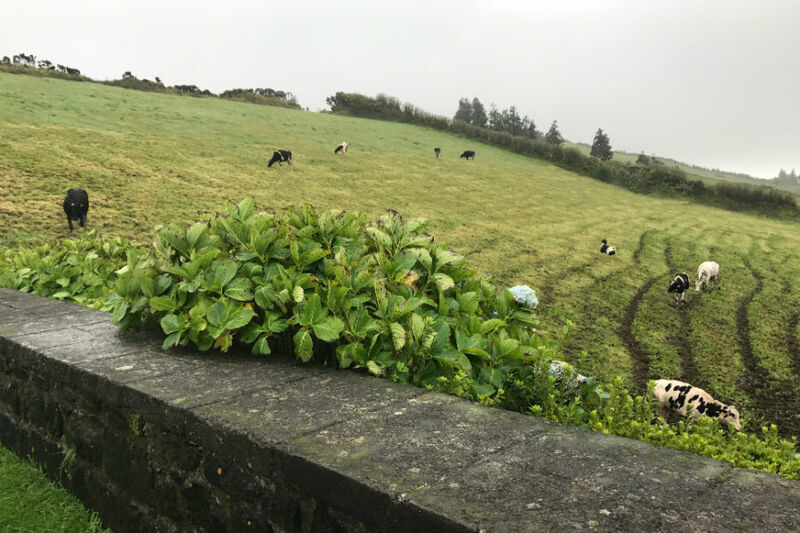 Fabulous local cheeses and excellent beef abound — the island's cow count rivals its people count. Couple that with the proliferation of local wines and terrific seafood, and you have a serious culinary experience. The regional specialty are limpets, a type of mollusk in a spiral shell. A bonus is that they are surprisingly affordable. We paid €40 for a scrumptious feast that included a bottle of local wine. The west coast of Sao Miguel. Taking a dip in the swimming cove. A pool with a view. 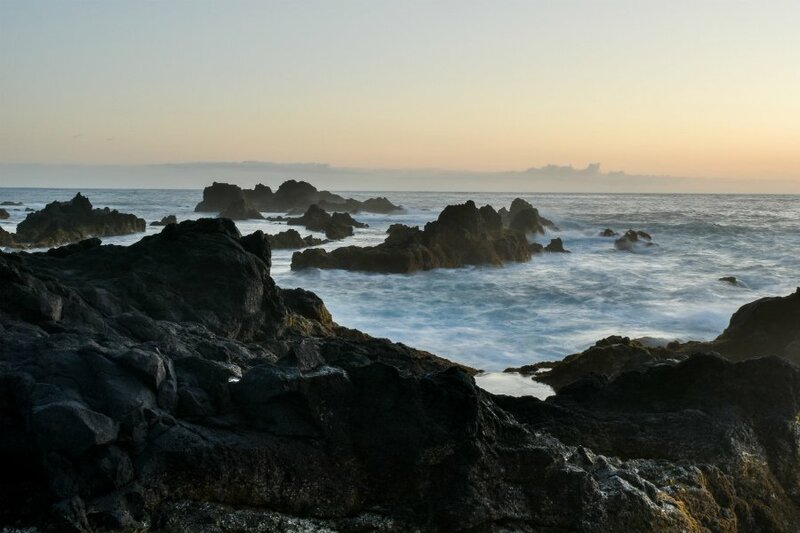 It's easy to roam, as everything is within a 30-45 minute drive of the main Azorean city of Ponta Delgado. Renting a car is a must. 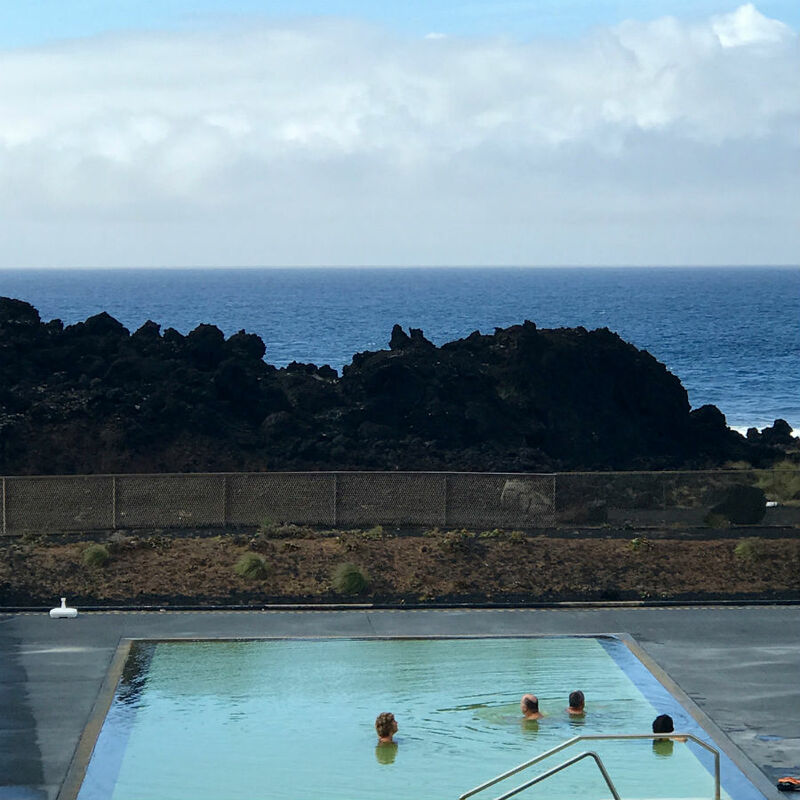 We chose to experience the volcanic thermal pools and spa offerings, starting with Termas da Ferraria on the west coast of Sao Miguel. From a cliff with an arresting view of the sea, we endured switchbacks and steep inclines to alight at a rocky outcrop. 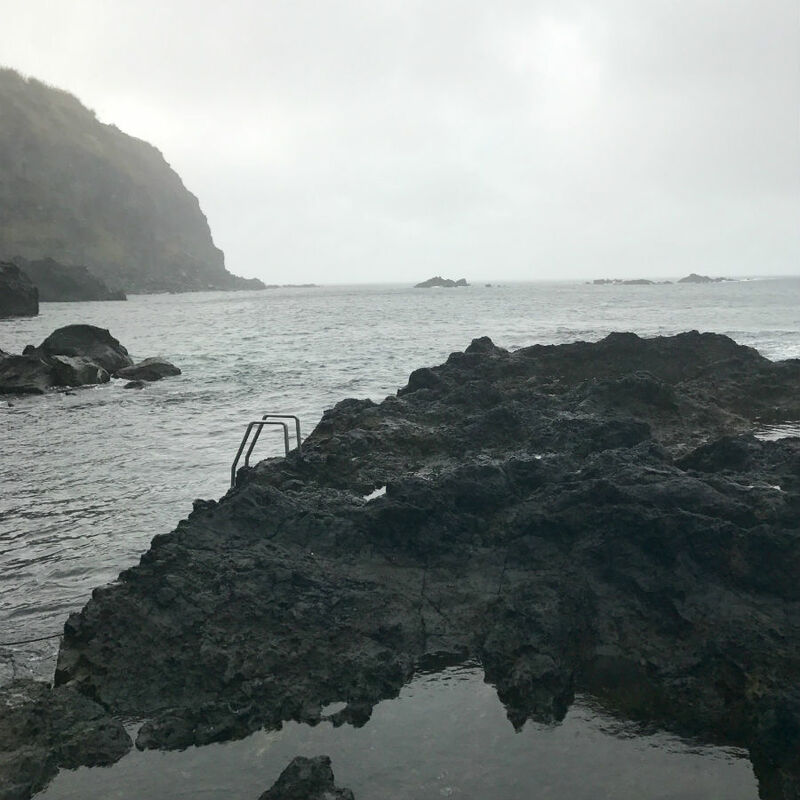 The public swimming cove opens to the sea, and we descended a ladder to experience the hydrothermal emissions mixing with the incoming bracing Atlantic water. The waves and temperature variations quickly woke us up after our overnight flight. The property also houses iron-rich outdoor and indoor pools, massage rooms, and a gourmet restaurant. We paid €125 for "King for the Day" access to all the pools, two massages, and a delicious fresh seafood lunch. The smoldering town of Furnas lies on the east side of the island in the volcanic caldera. Known for its thermal springs, bathing options include natural streams and pools at Poca Da Dona Beija, the gardens of Terra Nostra Gardens & Hotel, and the indoor and outdoor pools at Furnas Boutique Hotel. We lingered in the small town at the Microbial Observatory to learn about the fascinating creatures that thrive in the extreme terrestrial heat. After a few turns around the hippodrome to verify our English riding skills to our guide, we took the horses to the caldera edge for a panoramic view, then circumnavigated Lake Furnas. Along the ride, we came across locals burying pots of stew to cook in the steaming and bubbling earth. The result, cozido, can be sampled in the town's restaurants. The stables, Equi'Acores, outside Ponta Delgado, organize more extensive multi-day rides across the island. Quinta da Terca also offers riding excursions. The Azores are known for terrific scuba diving, and each island has its own unique marine environment. About 30 minutes offshore from Sao Miguel are shallow hydrothermal vents and a Liberty shipwreck from World War II that's accessible from the south side of the island (weather permitting) with Azores Sub. Other popular activities include whale watching and hiking the extensive trail network to waterfalls and the caldera lakes of Sete Cidades and Lagoa do Fogo. An Azor Hotel suite. Photo courtesy of Azor Hotel. 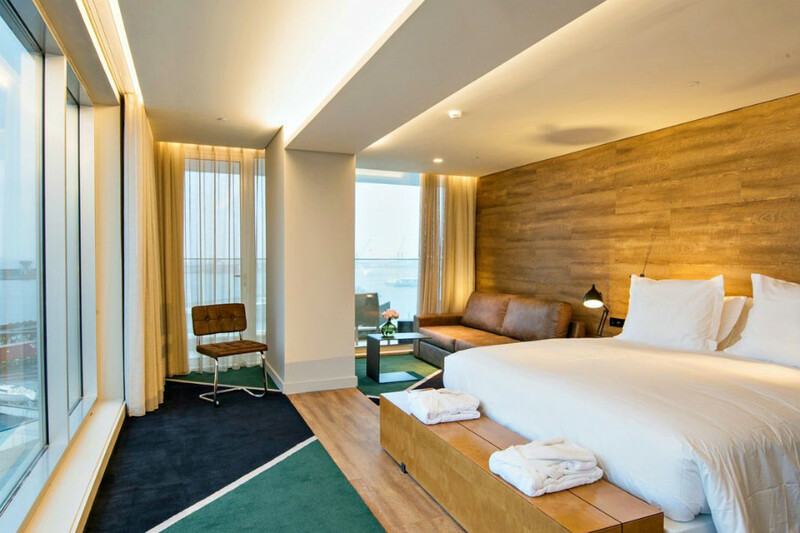 We stayed at the brand-new, Starwood-affiliated Azor Hotel on the marina of Ponta Delgado. The large suite with a wraparound balcony and modern design provided stunning views of the sea and island geography, and the service was top-notch. The ease of accessing the entire island by car makes staying in one hotel a great option. Each of the nine islands is unique and deserves a visit by inter-island flight from Ponta Delgado. There are vineyards at the base of Pico volcano on the west side of the island chain and gorgeous beaches of the oldest island, Santa Maria, on the east side. On Pico, a good base is the unique Lodge of Pocinho Bay. On Santa Maria, the brand new hotel and spa Charming Blue. Non-stop flights now reach the Azores from Boston, Toronto, Providence, Oakland, and London. From Boston, the flight-time is around five hours on SATA Airlines, at an affordable $400 round-trip. Julie is a scientist and a professor of oceanography and meteorology in NYC. You can follow her on Twitter at @droceanjulie. She travels for the wonder and perspective.